Socialist Aotearoa, The Greens, Workers Party, Communist League, Communist Workers Group, RAM/Socialist Worker, UNITE, the National Distribution Union are uniting against the "right". The far left wants to build a mass movement to bring down the National/ACT government, such has been recently happening in Greece. There's a new spirit in the fighting Left of Auckland. Faced with a barrage of attacks from the new National led government, in particular the 90 Day Fire at Will Law (which now comes into effect on March 1st, thanks to pressure from ACT), socialists, unionists and left Greens have got their act together and began planning the fightback. Socialist Aotearoa organised an inspiring meeting on Thursday 11th December, where Unite union's John Minto and the Green's new MP, Catherine Delahunty, joined SA's Frank Doleman in outlining the need for a united front to resist the effects of the international crisis in capitalism and the new government's attacks on workers and the poor. Leading activists from the Workers Party, Greens on Campus, the National Distribution Union, the Residents Action Movement, the CWG and the CL also spoke from the floor. All agreed that we could work together round the slogan "We won't pay for their Crisis". 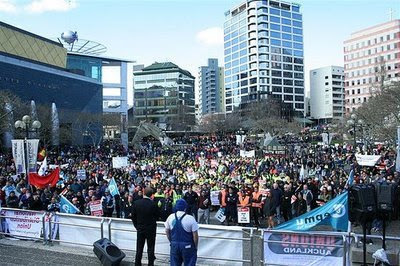 The next day saw this new unity in action, where activists from Socialist Aotearoa, the Workers Party, Greens on Campus and Unite joined a vocal picket of John Key's Auckland mansion, as his government rammed through the 90 Days Fire at Will Law. (a) Call a National Day of Action against this government and its attacks on workers rights, in particular the 90 Days Fire at Will law, on Saturday Febuary 28th 2009. (b) Build this day of action through all our union, community, college and political networks, and organise mass postering, leafleting, stickers and badges to oppose the Fire at Will law. Activist stalls will take the word out to major markets, workplaces and city streets. (c) the stalls will also collect pledges of resistance from those who want to do more than just sign a petition, who will then help staff a Rat Patrol which can picket, protest or occupy any workplace where a worker has been unjustly sacked using this law. This warning goes out to employers immediately. (d) organise a major weekend conference on the Global Economic Crisis in mid or late March, with respected international critics of capitalism and a wide range of speakers from Aotearoa's fighting left, to help educate and cohere the movement we bring out onto the streets on Feb28. The answer is building a powerful coalition of our community, political and union organisations to resist them on the streets and in every workplace facing their attacks. We need to learn the lessons from workers in other countries who are already resisting the Crisis. Factory occupations in Chicago got the goods against redundancies imposed by the banks- a tactic that we should educate NZ workers facing the sack about. Irish teachers, pensioners and students have had mass street protests and fought back against cutbacks in public services- which is what we now face in Tory controlled Auckland City and with increases in the ACC levy. And the economic crisis has seen scenes in the cities of Greece not glimpsed since the heady days of Paris, May 68, as a generation of students and young people are joined by the organised working class in what 62% of Greeks refer to as a national uprising. Watch out John and Rodney-the reds are back! what happened to the commuist party aotearoa - are they stil around? and the pro-USSR party that published red flag - are they gone as well? These leftist pricks can't accept the democratic choice of the people. "organise mass postering, leafleting, stickers and badges to oppose the Fire at Will law. Activist stalls will take the word out to major markets, workplaces and city streets." Sadly, it's called having no money. Because we have had a decade of debt-funded economic 'growth' and excessive taxation. New Zealand can otherwise either borrow until bankruptcy or print money. Democracy...only when the far left wins is the apparent motto for these people. I find it very sad when people believe their political powers extend only so far as elections. A person has numerous ways to use their political power outside of election. It is about time people stopped being so dis empowered.